REIDEA essential oil diffuser designed with an ample 500ml capacity, it has virtually every possible option and makes a lovely addition to any space, it uses the latest in ultrasonic technology to bring you maximum empowerment of soul and body, releasing the tiniest of micron-sized droplets that suspend in the air longer, yielding maximum inhalation benefits. FAMILY FRIENDLY & SAFE TO USE! Whisper silent (Noise<30dB) electric diffuser and light shutoff setting lets you and the kids sleep soundly. Improved safety with cold ultrasonic diffuser technology and water sensing auto shut-off function. Indulge the senses with a luxurious sensory spa experience with transformative, aromatic powers. Utilizing an innovative ultrasonic technology, REIDEA Aromatherapy Diffuser purifies and deodorizes the air you breathe in. By producing negative ions and atomizing the essential oils, the ultrasonic therapies work to boost your energy level and immune system to improve the quality of your sleep, sharpen focus, eliminate headaches, reduce chronic pain, prevent illness, moisten the air, and protect skin and more. Start your day off on the right foot with improved sleep quality, keep your office smelling great all day and enhance your evening time routine with aromatherapy benefits. Portable 500ml design ensures ease of use when transporting between rooms, such as the office, yoga studio, living room, nursery and bedroom. Set a romantic or soothing mood with the diffuser’s seven color changing modes that cast a calming glow while the unit’s silent operation, auto shut off and timed functions mean you can use anytime, day or night. 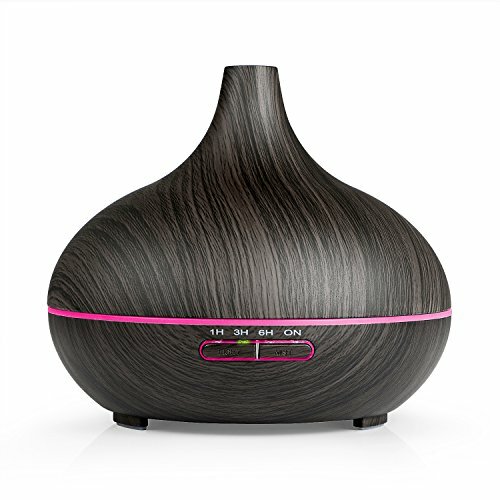 Improve your wellbeing today with the REIDEA Aroma Diffuser, because you deserve the best! I LOVE LOVE LOVE this diffuser. Don’t have to refill as often as my smaller one and the amount of scent it puts out is phenomenal! I would purchase this over and over if I had the money. ?It has a nice packaging includes instruction manual and measuring cup. I am very happy with it, it worked properly, has strong mist and easy to use. It’s bigger than I thought. I recommend this product. Works amazing best diffuser I have. ?This is such a stylish diffuser. It fits in with my decor nicely and the changing light color is really cool at night but not distracting. This is my first diffuser and it’s really easy to set up and get going. Nothing complicated. Very quiet and soothing and smells great! I love this diffuser!! I am using it in my office e which is fairly large and it keeps my whole space smelling amazing!! I love the way it looks, the mellow lights, and everything about it! So happy with this purchase!!! So far I’m loving this prime day deal.Top notch customer service team. Thanks again for the help. 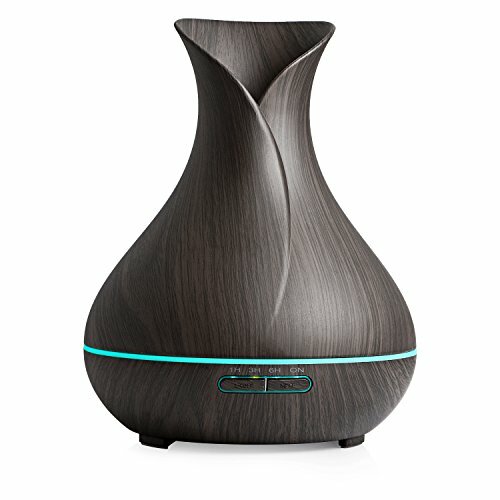 REIDEA AROMA DIFFUSER …, pretty looking. Great for an mans office in my opinion. Has a small band of light that won’t bother you while difussing during the night. I like the auto shut off option, won’t burn up when it runs out of water. This acts as a humidifier and purifier as well as beneficial when you add several drops of essential oil. Great for when anyone gets a cold , add sum Eucalyptus & peppermint. It’s 300 ml & will run various times depending on your settings. Easy to use and maintained easily as well. I used a q tip ( dipped in alcohol) to clean the lil silver piece at bottom ( once a week) and it keeps it running great. Great product. Recommend this to everyone. Love it.Bought another diffuser from a different company, but it quit working.This one is holding up well, performs as described, adds ambiance to the room both with the soft light effects and the aromatherapy diffusion. Really like the darker color, too.Very happy purchase. Bought the extended warranty “just in case.”Good value. Beautiful and quiet. I’m new to oil diffusers so I have nothing to compare it to, but it does the job I need it to and it’s nice to look at. I love this product and will order more. I put this in my spa and it has generated a lot of interest which I of course shared. I love the timer feature, that it’s a humidifier too, the different colors and that it’s so easy to work. Worth the money!!! I thought this was going to be bigger based upon the pictures on amazon showing it sitting on a coffee table and next to a gal doing yoga. Don’t go by that. It holds a little over a cup of water and the diameter is about the same as a salad plate. Aside from that, it is a nice size as far as not taking up too much space and does not make any sound at all. I wasn’t sure how I would feel about the changing colors but it is actually kind of soothing to watch. I use this for essential oils, in which case it is effective in quite a large room, or with plain water to add some humidity during the colder weather. You can adjust how much vapor comes out and it is decent, but if you want to humidify a room for several hours, especially at night, I would opt for a traditional humidifier with a larger capacity. Super cute, love the colors, and not noisy like cheaper ones. I have another name brand one that I paid triple the price for, and I would say this works exactly the same minus a few features, however this one has a cup to fill it, which my expensive one did not. So all in all. I would recommend this, but not for a small room, more medium to large size, or the aromatherapy may be too much. Love this so much, I bought a second one!! Whisper quiet, and the fact that it’s a humidifier is a big plus. The auto shut off is a great feature, as I use it to diffuse oils to help me sleep. Love that it shuts off when it’s empty. I just got mine from Amazon a few days ago. I have used it everyday and I love this product. I would recommend to anyone looking for a product like this. Easy to use, works wonderfully.